But they don't. In their quest for profit at any cost, they violate the basic tenets of virtue. They betray humanity. They destroy life. They malign Mother Nature herself, and in doing so, they threaten the very future of sustainable life on our planet. Here, I unravel the fundamental "violations of virtue" that Monsanto practices on a daily basis. It is these things, I think you'll agree, that make Monsanto a despicable corporate entity and a threat to all humankind. Monsanto's actions are designed to maximize its corporate profits, not to serve the people. Its entire seed-and-herbicide business model is designed to trap farmers in a system of economic dependence... to turn farmers into indentured servants who can never return to traditional farming after their soil has been destroyed with Roundup. Monsanto's products cause death. They compromise and violate life. Monsanto's GM corn grown a toxic chemical right inside each and every corn kernel. This corn is what is subsequently eaten by humans. 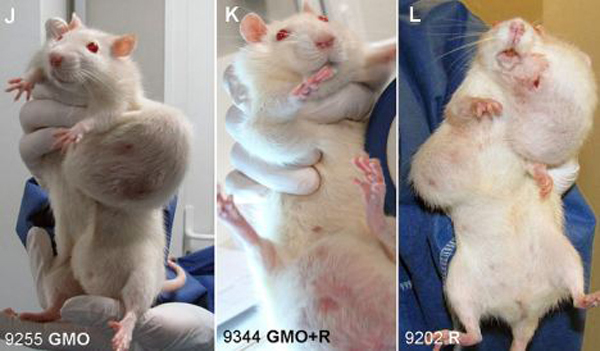 In a recent scientific study, a shocking 70 percent of female rats died prematurely when fed GMOs. Fifty percent of males died early. Almost all of them died from cancer tumors. Monsanto is spending millions of dollars to try to defeat Proposition 37 in California -- a bill which would simply require GMOs to be indicated on food labels. But Monsanto and other companies such as those that own Larabar, Silk and Kashi do not want consumers to know the truth about GMOs in the foods they buy. (See the GMO boycott infographic here.) They're also spending huge sums of money to try to defeat Proposition 37 so that the food companies can keep GMOs a dirty little secret about the poison in your food. Plainly stated, these companies do not want you to know what you're eating. And why? Because you're eating poison! Monsanto does not create technology and then share wisdom with farmers; instead the company patents its GE seeds and thereby claims monopolistic ownership over them. This patent is used to punish farmers! When Monsanto's GMO seeds blow into the fields of farmers who are trying to avoid growing GMOs, Monsanto uses its patent "rights" to sue the farmers and claim they "stole" Monsanto property! This is an example of the kind of pure evil Monsanto engages in on a regular basis. From the top company executives to the bottom of the corporate ladder, people who work for Monsanto are engaged in promoting a sickening, unprecedented evil that's spreading across our planet like a black slimy cancer tumor. That's no coincidence, either, considering that eating GMOs causes massive cancer tumors. Instead of working with the beauty, the genius and the abundance that has already been engineered into nature, Monsanto seeks to violate nature, overriding healthy plant genes with poison genes that generate insecticides right inside the crops. Instead of honoring the natural ability of seeds to reproduce generation after generation, Monsanto develops "terminator seed" technology that causes seeds to self-terminate after one generation. This, by itself, is a heinous crime against nature, humankind and planet Earth. It is a crime worse than the Nazi holocaust, for terminator seeds threaten ALL human life on our planet... billions of lives are threatened by the behavior of Monsanto. Roundup herbicide devastates soils, rendering them contaminated and unable to produce healthy crops using traditional (or organic) farming methods. Once a farm plot is destroyed with Roundup, that farmer is forever enslaved to a chemical-based farming protocol. It's unhealthy, it's a disaster to the environment, and the actual crop yields are LOWER than with organic farming, over a period of five years or more. By encouraging farmers to spray literally millions of acres of farmland with Roundup, Monsanto is engaged in a conspiracy to destroy our agricultural heritage and turn us all into "food slaves" that must pay tribute to Monsatan. The so-called "science" coming out of Monsanto is some of the most inane, malicious and brutally deceptive junk science ever fabricated by corporate science sellouts. Instead of testing GMOs for long durations on animals, Monsanto-funded scientists test GMOs for a mere 90 days and then adamantly declare the food to be "safe" for a lifetime of consumption by humans. It's no wonder they didn't run long-term tests: The real acceleration in cancer tumors only emerged after the 90-day milestone in rats. Even if Monsanto-funded scientists found GMOs to be safe in a "lifetime" feeding study, you couldn't trust those results anyway: Any scientist, politician or media group with financial ties to Monsanto must now be assumed to be compromised and lacking any credibility whatsoever. Monsanto has bought off countless scientists, experts, media writers and politicians. But paying them off doesn't alter reality. Poison in the corn is still poison in the corn, even if you pay a group of sellout scientists to foolishly declare otherwise. Something is terribly, terribly wrong with corporate behavior in America, and Monsanto is just one of thousands of corporations which demonstrate highly irresponsible, extreme, destructive behavior. The very design of corporations is missing something: HUMANITY. Sure, corporations are great at generating profits, streamlining logistics, manufacturing, marketing and so on. But where's the humanity in all that? It's nowhere to be found. Corporations don't care WHO they harm, WHAT they destroy, HOW they behavior or even HOW FAR they have to go to make another buck. Here at NaturalNews.com, we've documented corporations engaging in the most despicable, anti-human behavior imaginable, including using little children as vaccine guinea pigs, secretly testing diseases on prisoners, routinely falsifying evidence, bribing physicians, lying to regulators, engaging in efforts to deny consumers access to more affordable products, inventing fictitious diseases ("disease mongering") to market toxic drugs, and even hiring P.R. firms to spread lies and disinformation online through social networks and websites. And that's just the pharmaceutical industry. Think about the evils perpetrated by the agricultural giants, weapons manufacturers and globalist banks. There is no end to their destruction. A corporation is like a cancer tumor. It wants to tap into more and more resources, growing larger and larger until it kills everything. That's the innate drive of nearly every large corporation you've ever heard of: Get big, destroy the competition and DOMINATE! Even if it means killing our future. When corporations become so powerful that they practically run the government -- as they do now -- the correct descriptive term for that arrangement is Fascism. How do you stop Fascism? With a revolution, of course. And a peaceful one would be far preferable. As we see our present-day society being utterly destroyed by corporations -- banking, agriculture, pharmaceutical, etc. -- we must get serious about what needs to happen to change the structure of corporations so that they serve humanity rather than destroying humanity. #1) Strip away corporate personhood protections. #2) Deny all patents on seeds, genes and medicines. Such things should belong to everyone, not to a monopolistic few. This would also take the profit out of medicine, meaning drug companies would no longer have a financial incentive to fabricate and promote fictitious diseases. #3) Ban all corporate lobbying and campaign contributions. No corporation should have access to lawmakers, period. Lawmakers should serve the people who elected them and no one else. #5) Nationalize the Federal Reserve and make it "America's bank" so that Fed money is owned by the People and benefits the People instead of globalist banks. #6) Halt the "revolving door" where government regulators take high-paying jobs at the very corporations they've been regulating. Once a person works in an influential position for a government regulator, they should be forever restricted from working for the industry they once regulated. #7) End "Free Speech rights" for corporations. Corporations are not people. They have no God-given rights. By ending this fabricated "right," we could institute strict advertising limits that would prevent corporations from advertising harmful products to children and adults. The ultimate solution, of course, is a consumer solution: Stop purchasing products from evil corporations! This means you need to stop buying non-organic corn products such as breakfast cereals, corn tortillas, and corn snack chips. Stop buying lawn pesticide chemicals. Stop buying medications. Stop buying toxic perfumes, cosmetics and personal care products. Stop buying soda pop and aspartame! YOU help shift the world in a more positive direction by shifting your own personal purchasing habits. And that's something you can control right now, today, starting with the very next dollar you spend at the store. BUY ORGANIC, non-GMO products wherever possible. You'll be changing the world one purchase at a time. That's a genuine, practical way to diminish the power of evil corporations starting right now.